Please join us for a fun afternoon of games, dancing, tumbling, and fun! We will have our HS cheerleaders helping out with a wonderful afternoon learning about what a wonderful sport cheerleading is. For those who already love it, advanced skills and tumbling area will be set up. 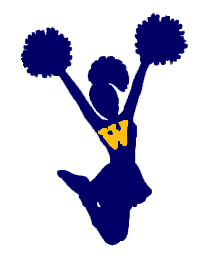 If your daughter is in 6-8th grade and is interested in cheer, please plan to stay at pick up and we can share the exciting opportunity with Weston's competitive cheer team.